Lahore: A special train carrying troops from Pannu Aqil to Kharian Cantt has met with a horrible accident at a canal bridge near Gujranwala. Pak Army spokesman has yet to confirm any causality stating that till now 80 cops have been rescued . 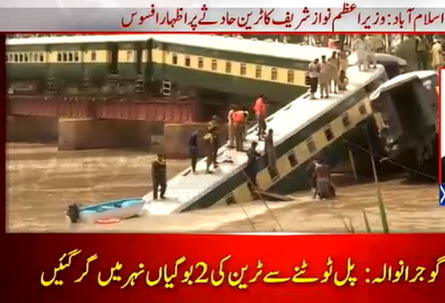 Pakistan Railways Senior General Manager Javaid Anwar said that Engine and one Bogie was completely under water where as three bogies were holding in the air. Pakistan Railways spokesman has said that it might be terrorists activity as half an hour before the accident ,Pakistan Express passed by the same bridge smoothly.Casualties feared as train carrying military troops falls into canal near Gujrawala,he added. Minister for Railways Khawaja Saad Rafique has said that senior officials are deputed to conduct inquiry of the accident,they would submit initial report till the evening.I am going to visit the venue and soon be there,Kh Saad added.